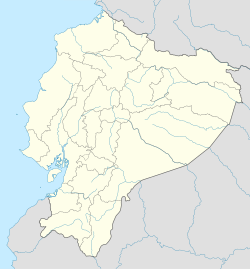 Ambato (Spanish pronunciation: [amˈbato]; full form, San Juan de Ambato) is a city located in the central Andean valley of Ecuador. Lying on the banks of the Ambato River, the city also sits beneath several tall mountains. It is the capital of the province of Tungurahua, at an elevation of 2,577 meters above sea level. It is variously nicknamed "City of Flowers and Fruit", "Cradle of the Three Juans", and "Garden of Ecuador." Inhabitants of Ambato are called Ambateños, Guaytambos (after a type of native peach that the valley is famous for producing) or Patojos. The current mayor of Ambato is Luis Amoroso. 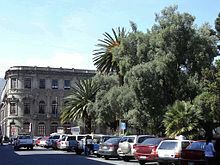 The city of Ambato was founded in its present location on December 6 1698 as the Seat of Ambato, on the request of Ambateños to the Royal Audience of Quito. For the next century, Ambato grew slowly into an important mountain center. The city was to play a pivotal role in the Ecuadorian War of Independence. On October 9 1820, the citizens of Guayaquil, along with help from a number of Venezuelans and Colombians, declared independence from the Spanish monarchy. The group raised an army (known as the Junta de Guayaquil), and began to move against Spanish forces in Quito. On their way to Quito, Ambato was one of the first cities to be liberated. The city formally declared it's separation from Spain on November 12 1820. On 5 August 1949, the city was struck by a devastating earthquake. It is estimated that more than six thousand people died, and thousands more were left homeless and destitute by the disaster. Much of the city's colonial center was completely ruined, including the cathedral that many considered on par with Cuenca's Iglesia de El Sagrario. The city was rebuilt with significant help from international aid organizations and the Ecuadorian government. The new modernist cathedral was inaugurated on 12 December 1954. Ambato features an Oceanic climate (Cfb) under Köppen climate classification. As a transportation hub, Ambato also depends on small tourist sector. Though not as charming or cosmopolitan as larger cities like Quito or Guayaquil, or as attractive as smaller cities like Baños or Otavalo,[original research?] Ambato's attractions include the modern cathedral and the Mera house. Tourists often use Ambato as a base for visiting nearby towns like Quisapincha or Píllaro. The Monday market also brings tourists and locals alike as the streets fill with food and clothing vendors. Many consider Ambato to be a quintessential 21st century Ecuadorian city: proud of its history, but eager to emerge as a leader in industry and technology. The Festival of Fruits and Flowers is held every year in Ambato to commemorate the anniversary of the earthquake that destroyed the city on August 5, 1949, where 6000 people lost their lives. The festival was created on 29 June 1950. Although the earthquake was in August, the festival is celebrated in February to fall closer to Carnival. The rich volcanic soil of the area are home to a large number of farms and a great diversity of agricultural products. Ambatenos refer to the city as the "land of the three Juanes,". Ambateños are commonly referred to as Guaytambos or Patojos - . In the center of the city is the emblematic Montalvo Park. Named after the Ambato-born writer, Juan Montalvo, the park was built in 1905 and has served as a social gathering spot for the people of Ambato since. The park was designed by local architect Pedro Durini. It lies at the meeting point of four important streets in Ambato: Montalvo, Sucre, Bolivar, and Castillo. It also sits in the shadow of the modern cathedral which has served as a symbol of the new Ambato. The statue of Juan Montalvo at the center of the park was built in Italy by Pietro Capurro. It was inaugurated in 1911. The mausoleum where Juan Montalvo is buried is just down the street. The park is currently undergoing a $450,000 renovation to restore the gates and walkways that surround the park. Traditionally considered the most influential neighborhood, Miraflores abuts the downtown on the west side. Miraflores used to be the location of the train depot, connecting it with the city of Quito and giving it a very important position in the city. Without a passenger train through Ambato, Miraflores is now a residential neighborhood, so named because of its many flowers. Perhaps the oldest of Ambato's neighborhoods, Atocha is famous for being the home to the Quinta Juan León Mera and thus, being an important part of Ambateño and Ecuadorian culture. Together with Ficoa, Atocha makes up the north end of the city. Atocha is also known for the production of colada morada, a purple, spiced drink that is traditionally consumed with bread. Around Carnival, Ambateños flock to Atocha for the drink. As an important transportation hub, Ambato is connected with other cities through Ecuador's widely used bus system. Although there used to be train service running through Ambato from Quito to Riobamba, this service has long since closed. Ambato has an airport, the Chachoan Airport in the Izamba neighborhood, but it is not used for commercial flights. The city's main bus terminal is located in the Ingahurco neighborhood, which lies on the north side of downtown. This main terminal, or Terminal Terrestre (as it is known in Spanish), serves some of the country numerous bus operators. There are plans to renovate the aging bus terminal, making it the main terminal in a network of terminals around the city. As it stands, travelers can also catch buses traveling to the south from unlabeled stops along the Pan-American Highway. Ambateños enjoy a variety of sports, but none so much as soccer. Ambato plays host to three professional teams, playing in Ecuador's highest leagues: Macará, Técnico, and Mushuc Runa. Macará and Técnico currently play in Serie A and Mushuc Runa in Serie B. All three teams play in the centrally located Estadio Bellavista, and Mushuc Runa also maintains one of the world's highest altitude practice stadiums in the Chibuleo community about 20 minutes outside of Ambato, although as it exceeds FIFA altitude rules it is not used for Series fixtures. None of the three teams has been wildly successful in Ecuador or beyond, however they maintain a loyal following of spectators. Matches between Macará and Técnico U. are known as El Clásico Ambateño (English: The Ambato Derby). In 2007 both derby teams briefly played in Serie A for the first time in over ten years, and they have been regular fixtures of Serie A in the years since. In general, Ambato has at least one team in Serie A at any given time, and in 2018 Macará has led the series. There are many other sports popular among Ambateños including basketball, tennis, swimming, and Ecuavolley. Ecuavolley is a variation of volleyball, played specifically in Ecuador. It features three players per team on a small court with a high net. Players normally use a soccer ball in place of a volleyball. Ecuavolley is popular in Ambato and the surrounding regions, where it is played both on formal courts in city parks as well as on the side streets of barrios. ^ "Ambato - Population". Population.City. Retrieved 11 June 2018. ^ Merriam Webster's Geographical Dictionary Springfield, MA: Merriam-Webster, 2001. Third Edition. ^ Cevallos Garcia, Gabriel, Historia del Ecuador Cuenca, Ecuador: Editorial "Don Bosco" 1967, p241-2. ^ Cevallos Garcia, Gabriel, Historia del Ecuador Cuenca, Ecuador: Editorial "Don Bosco" 1967, p245. ^ Ilustre Municipalidad de Ambato " "Archived copy". Archived from the original on 2009-04-29. Retrieved 2009-04-28. CS1 maint: Archived copy as title (link)"
^ "Puente Juan León Mera habilitado al tránsito vehicular esta semana" El Universo 18 October 2008. ^ http://www.elcomercio.com/2010-09-22/Noticias/Pais/Noticias-Secundarias/EC100922P12BUSES3RA.aspxVenezuela renovará una parte de sus autobuses en el Ecuador. 22 September 2010. ^ "Los trabajos de regeneración avanzan en el parque Montalvo" El Comercio 2 July 2009. ^ "El parque Cevallos no será una plaza cívica"
Wikimedia Commons has media related to Ambato (Ecuador).